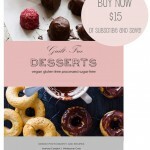 The new Guilt-Free Desserts e-book is here! 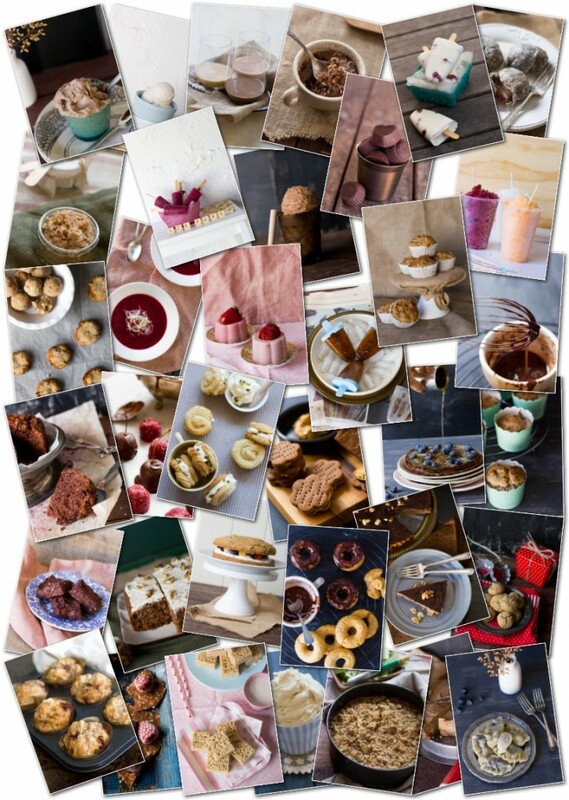 Containing 36+ easy to make all vegan, gluten-free and processed sugar-free dessert recipes! Anything from cake and cookies, through to icy treats and classics reinvented. PLUS extensive guides to gluten-free flours, sugar and sugar substitutes! It is completely vegan, gluten-free and processed sugar-free. All except for one recipe are soy-free, only a few contain corn-based products but mention appropriate substitutes and only some contain nuts, making it one of the most allergy-friendly cookbooks around (perfect for kids parties, large gatherings, etc). Here is the full contents list. 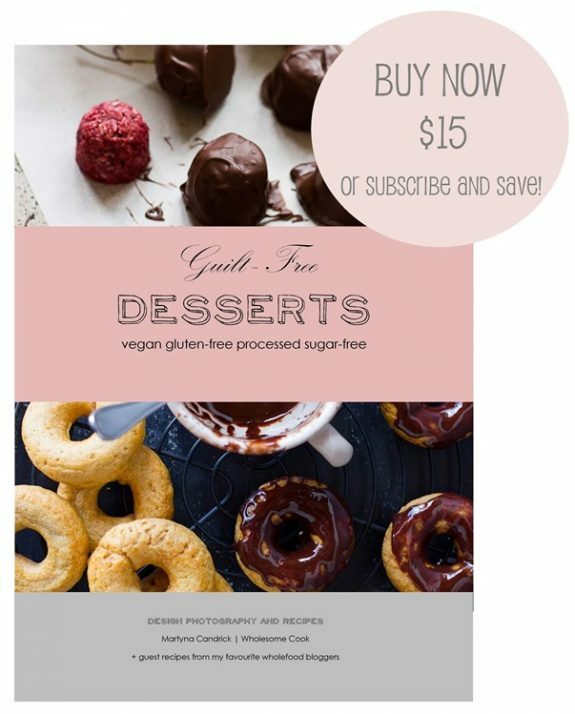 As a special reader offer, all Wholesome Cook email subscribers are eligible to receive 30% off the Guilt-Free Desserts purchase price. If you are already subscribed you will find your discount code in the email containing this post. Feel free to subscribe now and benefit from the $4.50 saving. Instructions of how to proceed will be sent to you in the welcome email. Offer is valid until 30 March 2013. PS Why not become an Affiliate? If you would like to earn 25% from my eBook sales you refer, join My Affiliate Program. 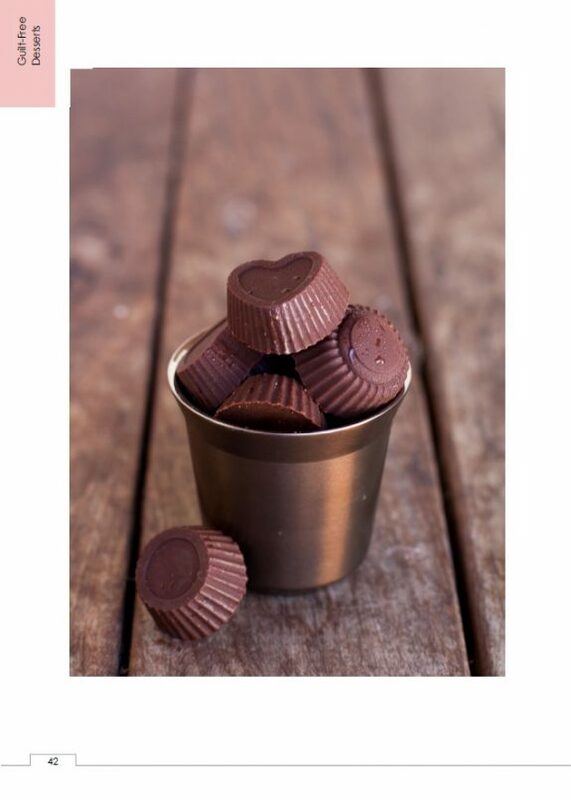 Did you know that most chocolates contain anywhere between 20 and 56 grams of sugar per 100 grams of chocolate? Even the rich dark varieties are high in the white stuff. Why not try this rich dark homemade variety, unsweetened, or with your choice of unprocessed sweeteners. The following recipe is for unsweetened chocolate. It is great to snack on if you like the dark stuff, or add to muffins or shave over sundaes. You can sweeten it with a couple of teaspoons of maple syrup or a few liquid stevia drops. Set up a bowl over a saucepan of simmering water (double boiler) making sure that the bowl is completely dry on the inside and the base is not touching the water in the saucepan. Add cacao butter to the bowl and allow to melt slowly. Once melted, remove from heat, making sure no water gets into the butter. Add cacao powder and mix well. Add maple syrup or stevia if using and mix gently. Pour the chocolate mixture into preferred moulds and set in the fridge for 2 hours or in the freezer for about 30 minutes. Store prepared chocolate in an airtight container in the fridge. Thanks BAM! 7 of the recipes are by guest contributors, the rest are mine plus there is a bunch linked to from within the eBook too (bonus!). Enjoy! Congratulations Martyna! That looks awesome 🙂 Sweet job!! Thank you Sneh 🙂 Always a pleasure to get your tick of approval! Congrats on the launch! The book is gorgeous and I’m honoured you asked me to be included! Congratulations Martyna, I’m so honored to be a part of this wonderful book! Thank you and it is a pleasure to have you on board! That photograph of your tart was inspired by your own shots – it was so rich and sensuous. This is fantastic. I am in definite need of this book. Congratulations lovely!! Great work Martyna! Looks fabulous. Congratulations on another cookbook, Martyna! I love the beautiful cover. Keep up the great work because you always inspire us! What a fantastic cookbook. Congrats on it’s creation. Will be adding it to my to buy list.